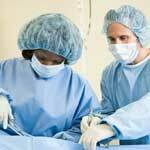 Hiatal Hernia Surgery - When Is It Required? Hiatal Hernia Surgery – When Is It Required? Hernias are loosely defined as body parts that end up where they shouldn’t be. In the case of hiatal hernias, the offending body part would be your stomach as it pokes its upper portion out through a hole in your diaphragm as if to take a look around. Hernias are easily treated with home care, over the counter meds, and diet and lifestyle changes, but every now and again, hiatal hernia surgery can be required when treatment options fall short of providing relief. More often than not, hiatal hernia surgery results from having a strangulated hiatal hernia. In this condition, the stomach plays jack in the box with your diaphragm hole, but lands next to your esophagus. This sub condition is more rare, but also more serious. When a hernia becomes strangulated, as the name suggests, it is no longer getting an adequate blood supply and therefore is not something that lukewarm baths and the avoidance of chicken wings on the hiatus hernia diet can help. Hiatal hernia surgery is reserved only for the most severe cases of hernias and most commonly only associated with strangulated conditions. However, if you and your doctor feel that your hiatal hernia symptoms are intense and life altering enough to consider it, it’s a pretty safe surgery with no more than the regular amount of risks associated with surgical procedures. Talk to your doctor about a treatment plan that is right for you and your condition that will not only help you reduce discomfort, but make better choices to keep your body happy.